Off the Beaten Path: Are You a Flirt? I think she was flirting. I've probably read this story hundreds of times and yet I never saw it until just recently. But I honestly think she was flirting. I was never much of a flirt. Not that I didn't want to be, in my day, but I just didn't know how to do it. I was horrible at it. Just ask my husband. Because of my lack of skills in the flirtatious banter between boy and girl, he almost didn't ask me out. Fortunately he persevered and eventually found out what a wonderful woman I am, but it was no thanks to my charm. But I know flirting when I see it. And this woman was flirting. There came a woman of Samaria to draw water. where then do You get that living water? Of course she didn't know who she was talking to. She didn't know Jesus was the Messiah, the Son of God, God incarnate. She didn't know. But we do. I do. And yet, as ill equipped as I am at flirting, in the normal sense of the word, I've flirted with Jesus too. I've flirted around my issues, flirted with the idea of extreme devotion, flirted with obedience, and flirted with His commands. I've teasingly made commitments I didn't intend to keep, winked at my sin and the sins of others, giggled over my trespasses like they were no big deal, called Him up when I had nothing better to do, brushed Him off at other times, and made Him chase after me numerous times. Like the woman at the well, I've responded to the King of kings with half-hearted interest, mocking adoration, and syrupy sweet sarcasm. She had an excuse for her ill behavior. I've had none. You see when the woman at the well began to realize this was no normal man she was talking to, she began to change her tune. “Sir, I perceive that You are a prophet. She stopped flirting and she started arguing. She got on the defensive. This guy wasn't cooperating with her flirtations. He wasn't flirting back. In fact, he had called her bluff and laid the facts on the table. She was a woman on a hunt. He knew her kind. He'd seen those same thirsty eyes on every other human being He'd encountered. He'd seen that same hungry expression on every woman, man, and child. Sure, people were hungry for different things. 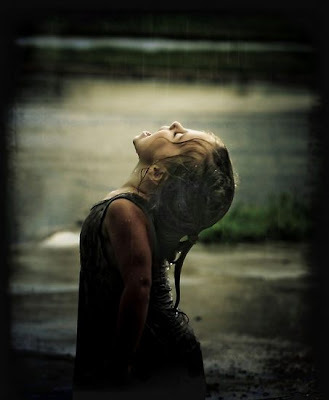 Some were seeking purpose, others significance, others a little joy. This woman was undoubtedly seeking unconditional love, but He'd seen people hungry for everything from peace to healing to companionship to simple sanity. And He'd given it all, too. 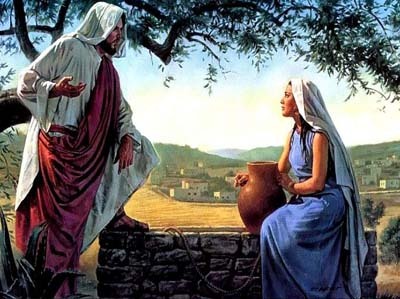 And He could give this woman what she was so desperately hungry for, too, if only she'd recognize her hunger for what it was, stop trying to feed herself through one doomed relationship after another, and turn to Him, the Fountain of Living Water. It was time to bring this conversation to the point. It was time to let her know who He was so she could make her choice. nor in Jerusalem will you worship the Father. for such people the Father seeks to be His worshipers. And the flirting stopped. And the arguing stopped. And the conversation stopped because Jesus' disciples suddenly returned from their mission to find food. Bad timing? No such thing with Jesus. It may seem to us that the conversation was interrupted abruptly and ended too soon. But Jesus had put the ball in the woman's court. 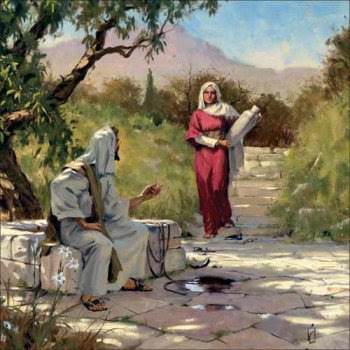 It was time for her to decide if she'd put her water pot down and let Him satisfy her with an inexhaustible supply of living water or if she'd continue to make trip after trip to empty cisterns to quench the thirst of our soul. 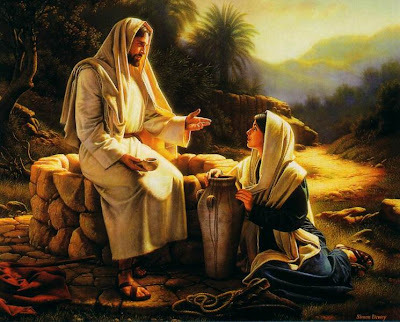 Good news: From what I can gather, the woman put that water pot down and turned to the Living Water for her soul desires from that point on. She quit flirting. She quit arguing. She started following, drinking in, and worshiping in spirit and in truth. So the question is, what am I doing? What are you doing? Are we still flirting with Jesus, toying around with the concepts He taught, wavering back and forth with our devotion, playing coy? Or maybe we've gotten our feelings hurt because He doesn't flirt back and so we've shifted to arguing with Him. Maybe we're sarcastic and bitter and resentful toward Him because He's saying things that convict, pierce, and challenge. It's time to stop flirting. Time to stop arguing. Time to start worshiping in spirit and in truth. 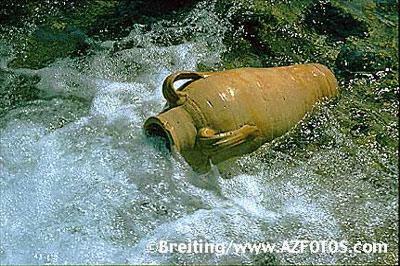 Time to put down that water pot with which we run to dry cistern after dry cistern. Time to drink Him in. Only Him.